As the home of South Africa's Parliament, Cape Town is the country's de facto legislative capital. 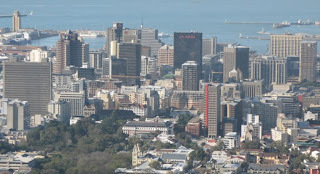 It is one of the largest cities in South Africa, a major seaport, and the capital of Western Cape Province. 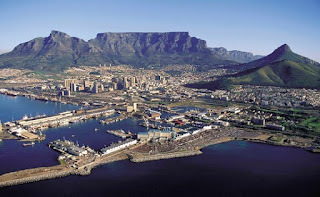 Cape Town lies at the northern end of the Cape Peninsula about 30 miles (50 kilometers) north of the Cape of Good Hope. It is located at the extreme southwestern portion of South Africa, on the continent's southern tip. The city has a Mediterranean climate, with mild winters (June to August) and warm summers. Temperatures drop to an average low of about 55° F (13° C) in July and reach an average high of about 70° F (21° C) in January or February. In the summer and fall, southerly winds produce a cloud cover, called the “tablecloth,” over Table Mountain. Cape Town is located in one of the world's most beautiful natural settings for city life. Parts of the city and its suburbs wind about the steep slopes of Table Mountain. 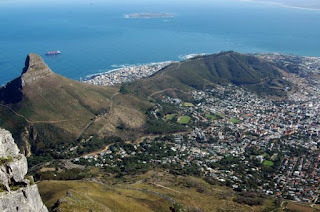 The oldest section lies in the area between the shores of Table Bay and the mountain and its outlying ridges known as Lion's Head, Signal Hill, and Devil's Peak. The construction of the Duncan Dock between 1938 and 1945 resulted in the recovery of 358 acres (145 hectares) of land from the bay, much of which became available for the extension of the central business district. Residential suburbs stretch around the western side of Signal Hill and the mountain, northward to Milnerton, and southward to False Bay. 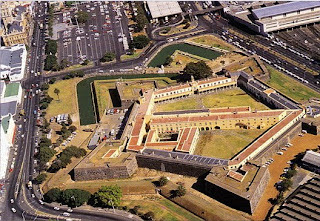 The Castle of Good Hope, dating from between 1666 and 1679, is the city's oldest monument. 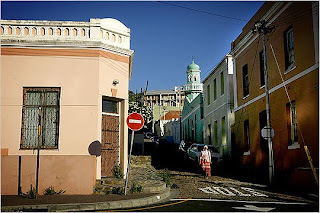 Situated in the city center, the castle forms a triangle with the National Botanical Gardens and the Bo-Kaap Museum, a reconstructed house of a family of Cape Muslims. Another notable building from the late 1600s was originally a slave lodge. It was later expanded and is now the South African Cultural History Museum. Also standing is Groot Constantia, the homestead built by Governor Simon van der Stel that dates partly from 1692, and the Groote Kerk, or Great Church, built in 1841. Some of the homes on the slopes of Signal Hill may have been built in the 18th century. One of the finest buildings remaining from that period is the Koopmans–de Wet House, built in 1701. It is furnished with pieces from the same era. The 90-mile (145-kilometer) peninsula coastline has many good places for swimming, fishing, and skin diving. Yachting is also a popular pastime. Cricket and rugby are played at the grounds at Newlands. Cape Town is home to the national library, several museums, two symphony orchestras, and theaters for concerts, opera, ballet, and plays. 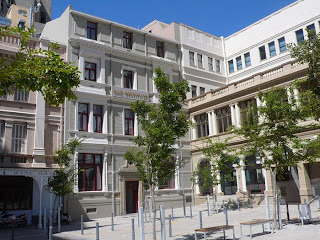 Diocesan College and the universities of Cape Town and of the Western Cape are the main institutions of higher learning. Cape Town is one of South Africa's chief centers of industry. A petroleum refinery and chemical, fertilizer, cement, and automobile-assembly factories are located in the metropolitan area. Among the city's major industries are ship repair and maintenance, textile and clothing manufacture, food processing, construction, and tourism. Many nationwide businesses have their headquarters in Cape Town. The port of Cape Town has an excellent harbor and good repair and dry-dock facilities for oceangoing ships. The Cape Town International Airport, the major airport in Western Cape Province, handles both domestic and international flights. A railway system extends northward from Cape Town to Zimbabwe and beyond. Commuter trains, buses, minibuses, and taxis provide local transportation. There is also an extensive highway system. Among the first residents of the Cape Town region were the San and Khoekhoe. Bantu-speaking peoples later migrated to the area. Cape Town is known as South Africa's “mother city,” because it was the site of the first European settlement in the country. Table Bay was visited by Portuguese navigators in the 16th century. French, English, and Dutch ships later stopped at the cape for fresh water and provisions. In 1652 the Dutch East India Company founded a station there to supply ships rounding the cape. The colony, which was then known as De Kaap (The Cape) grew and soon spread far beyond the cape peninsula. The importation of slaves, mainly from East Africa, Madagascar, and the Bay of Bengal area, and the addition of political exiles from the Dutch East Indies increased the population. In 1781 a French fleet helped the Dutch to defend the cape against the British. The French presence initiated a surge of building by about 1791. While the French were occupied with the French Revolution a British force took control of the cape in 1795. The colony went back under Dutch rule in 1803 but was reoccupied by the British, who called it Cape Town, in 1806. The treatment of the slaves was particularly harsh, and there were slave revolts on the outskirts of town in 1808 and 1825. The slaves were freed in 1834. By 1840 the population of Cape Town reached 20,000. Major road and railway construction was under way by 1859. The discovery of diamonds in 1870 and gold in 1886 brought many more people to the town, and by 1900 the population had grown to about 130,000. The Boer War, fought from 1899 to 1902, stimulated modest industrialization. In 1910 Cape Town became part of the newly created Union of South Africa. South Africa enacted laws enforcing apartheid—a system of racial segregation and discrimination against the country's nonwhite majority—beginning in 1950. Under the country's Group Areas Act of 1966, the nonwhite citizens of Cape Town (including blacks, Indians, and people of mixed race) were forced to live in separate sections of the city or on its outskirts, according to their official racial classification. The municipality of Cape Town resisted the apartheid laws more than did other cities in South Africa, however. Nonwhites could vote and hold office in Cape Town during much of the 20th century, though a national law of 1972 removed them from the voters' rolls, over the protests of the city's citizens. Cape Town continued to oppose apartheid legislation. A peaceful protest march of some 40,000 people in September 1989 led to similar protests elsewhere and eventually to the dismantling of apartheid altogether. After South Africa repealed the apartheid laws in the early 1990s, Cape Town again elected its leaders through majority rule. In 1998, in an attempt to better serve residents of all races, the city extended its municipal borders and began to restructure its government and services. (See also South Africa.) 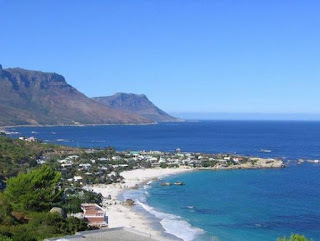 Population (2003), metropolitan area, 2,733,000.
cape town is the place ,many people want to go there ,yes you must visit this perfect place. .. Discovery of gold where, .. in cape town?